To understand what a lumbar herniated disc is, you must first know what a disc is. A disc is the soft, round cushion that rests between each vertebra in your spine. The disc is tougher on the outside, with a softer, jelly-like core. A herniated disc occurs when a disc degenerates and the soft core seeps out, irritating the nearby nerves and causing pain. A lumbar herniated disc takes place in the lumbar region of the spine (your lower back). Due to the fact that discs in the lumbar region are directly under the spinal nerve root, a lumbar herniation puts pressure on the nerve. Lumbar herniated discs can cause a lot of pain, so it’s important to seek medical attention straight away. Orthopaedic Associates of St. Augustine is proud to offer the St. Augustine and St. Johns communities one of the leading Spine Centers in the area. Dr. Brian Haycook, a fellowship trained spine surgeon, provides patients with expert orthopaedic care. 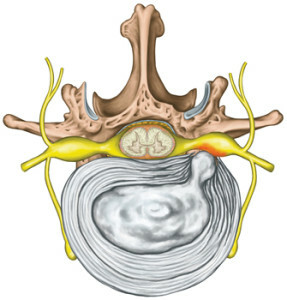 The main symptom of any herniated disc is pain. With a lumbar herniated disc, you may feel pain radiating through your leg, lower back, or buttock. In addition, you might experience numbness or weakness in the leg, big toe, or ankle. If the pain hasn’t subsided within 6 weeks, surgery is generally considered the best option. Microdiscectomy is a well-honed surgical procedure that works by removing the problematic part of the disc, relieving the pressure on the nerve root and allowing it to heal. Thanks to modern surgical improvements, microdiscectomy only requires a small incision and has a quick recovery time. If you’re experiencing pain caused by what might be a lumbar herniated disc, you should see a spine specialist immediately. To meet with a specialist at Orthopaedic Associates of St. Augustine, please request an appointment online or give us a call at 904-825-0540.